Fundraiser by Isabelle Feraudo : Save SHADOW's Boardwalk! 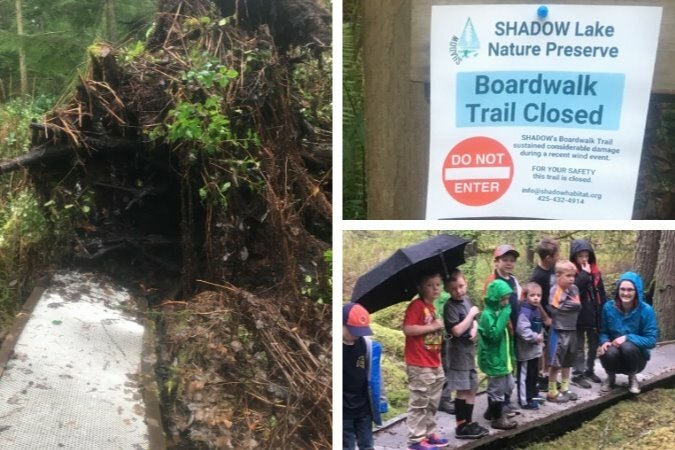 There are over 1,000 local students scheduled to tour Shadow Lake Bog this Spring, including every 4th grader from the Tahoma School District, and our Boardwalk trail is closed due to wind damage! Please save these student's field trips today!! Please chip in and help protect this unique learning opportunity for our students. 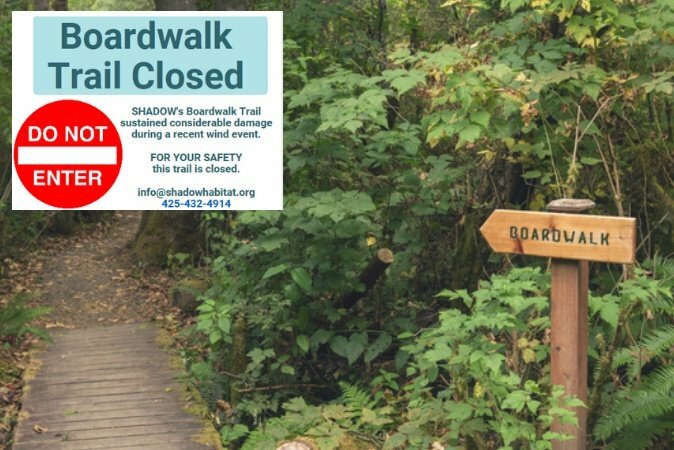 This weekend's windstorm toppled trees and closed SHADOW's most popular trail, the Boardwalk, indefinitely. If we are not able to reopen the Boardwalk in time, this year's forth graders will miss their opportunity to tour Shadow Lake Bog and learn about how the last ice age shaped our region. The wind storm, whose gusts reached up to 60 miles an hour, was an unforeseen emergency. In unincorporated King County, outside the limits of any city, SHADOW's Office and many of our neighbors were without power for multiple days. The damage caused by this storm will be costly to repair! 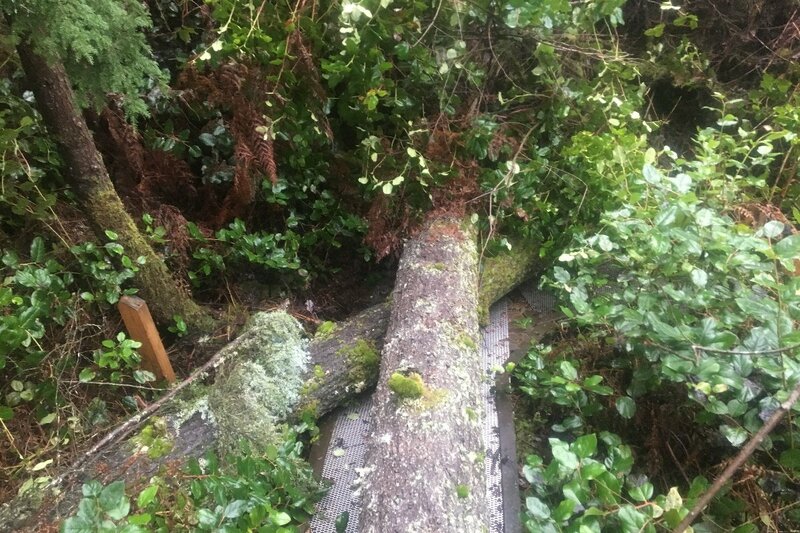 A lot of trees fell, making the Boardwalk unsafe for visitors. Beyond the children who learn at SHADOW, the Boardwalk is visited by over 3,000 local community members each year. It is a space for nature reflection and wetlands education. There are 12 brand new native plant interpretive signs being installed in the bog in 2019. Please help us maintain access to this vital green space! "Shadow Lake is important to the community, not only ecologically, but also as part of its identity." "From the moment we arrived it was a hands on learning environment. My students were engaged and genuinely interested... The fifth graders of Kent Mountain View Academy truly felt like citizen scientists." Any additional funds raised above and beyond the cost of repairs will be put directly into SHADOW's Education Program. Thanks to our volunteers, donors and community SHADOW’s boardwalk has been repaired! The boardwalk is once again open for the public to enjoy just in time for Spring. We hope you will come out for a visit soon to see all our beautiful native plants that are starting to bloom. We are so gracious for all the love that has been shared to help SHADOW! Things are slowly progressing to get this vital resource up and running again. A Tahoma High School student, volunteered his time to SHADOW to take some drone footage of the boardwalk. This video better shows the severe damage that the boardwalk sustained. Around 30 feet of our Boardwalk’s structure has been destroyed under the trees you see pictured. Rebuilding this will require the purchase of wood, screws, and pier blocks. Also, the stainless-steel mess that keeps our Boardwalk safe for visitors of all ability levels, even during the wetter months! Due to the sensitive nature of the ecosystem, removal of these trees will need an expert approach. Reducing our impact on the Shadow Lake Bog is central to everything that we do. We are grateful for the outpouring of support we have received from our community wanting to come volunteer! There will certainly be some opportunities for that as we get this work underway, hopefully lowering this portion of the cost. That being said, in a sensitive wetland habitat the majority of the install will need to be done by a small team of professionals. Thank you to everyone who has already donated! We are lucky to have such a strong community of support!! We have a lot of work ahead of us to get this vital trail field trip ready.